Traces of human occupation nearly 40 000 years old have been discovered at Mamontovaya Kurya (bend in the river where mammoth bones are found), a Palaeolithic site situated in the European part of the Russian Arctic. It was previously generally believed that this vast region was not colonized by humans until the final stage of the last Ice Age some 13 000 - 14 000 years ago. At the site stone artefacts, animal bones and a mammoth tusk with human-made marks were recovered from strata covered by thick Quaternary deposits. This is the oldest documented evidence for human presence at this high latitude. It implies that either the Neanderthals expanded much further north than previously thought or that modern humans were present in the Arctic only a few thousand years after their first appearance in Europe. Traces of human occupation nearly 40 000 years old have been discovered at Mamontovaya Kurya, a Palaeolithic site situated in the European part of the Russian Arctic. It was previously generally believed that this vast region was not colonized by humans until the final stage of the last Ice Age some 13 000 - 14 000 years ago. Caption: Photograph showing the find-bearing strata (I) near the base of the exposed sediments at Mamontovaya Kurya. The brownish layers with bones and artifacts are covered by younger alluvial (II and III) and aeolian deposits (IV and V). 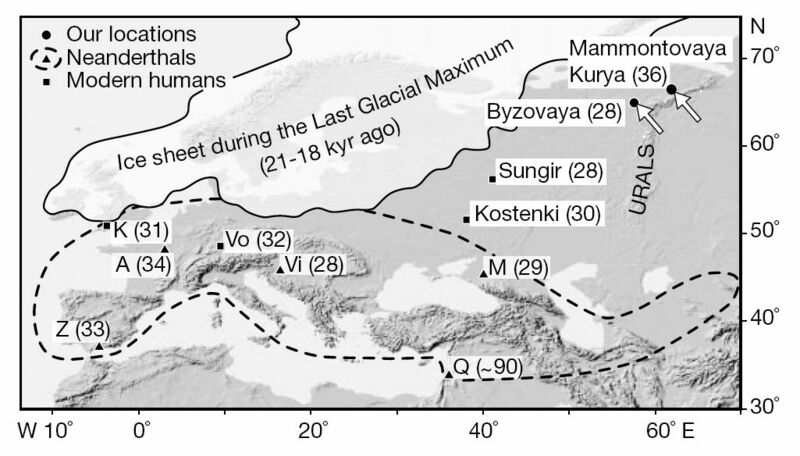 Map showing the location of the Palaeolithic sites Mamontovaya Kurya and Byzovaya discussed in the text and the maximum extent of the Eurasian ice sheets during the Last Glacial Maximum (21 000±18 000 yr BP). The area within which Neanderthal remains have been found is indicated with a dotted line. The location of radiocarbondated European sites with skeletal remains of late Neanderthals and early modern humans are also shown: A, Arcy-sur-Cure; K, Kent's Cavern; M, Mazmaiskaya; Vi, Vindija; Vo, Vogelherd; Z, Zafarraya; and Q, Qufzeh. Numbers in parentheses indicate radiocarbon ages ( x 103 yr BP). The Mamontovaya Kurya site is located on the southern bank of the Usa river, at 53 metres above sea level, at the Arctic circle at 66° 34' N; 62° 25' E, close to the polar Urals. The riverbed at this site has been known as a place for finding mammoth tusks and bones since the end of the 18th century, but finds of artefacts have not previously been reported. In order to clarify the stratigraphic context of these bones and to find out if they could be related to early human activities, archaeological and geological field investigations were carried out during the summer seasons of 1992, 1994, 1996 and 1997. 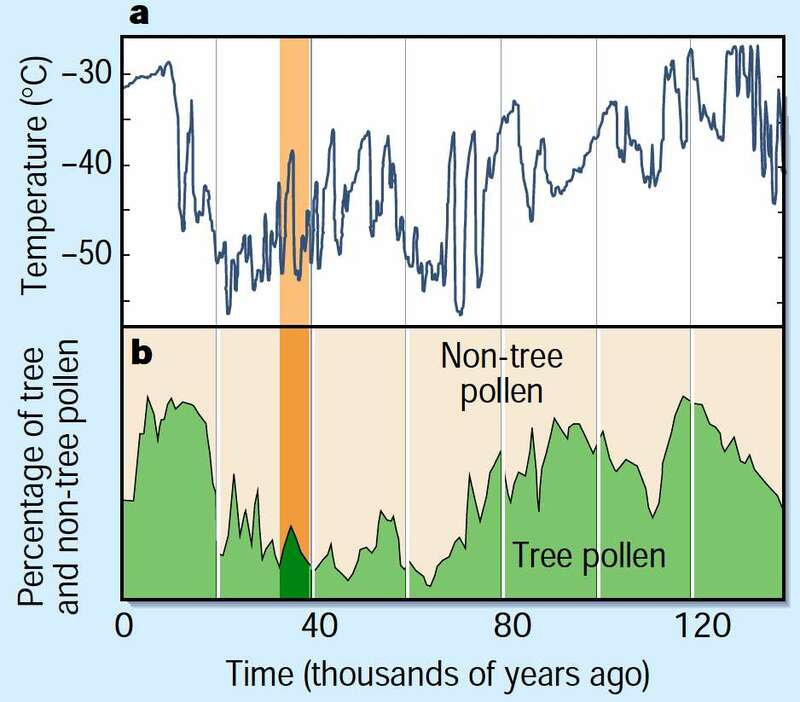 Climate and early human populations. Pavlov et al.’s finds from Mamontovaya Kurya1 are dated to the period shown by the orange shading. 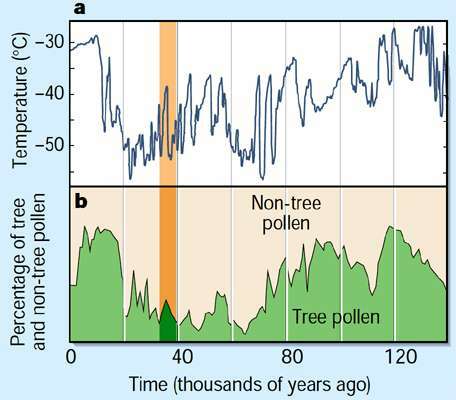 This is set against the backdrop of: a, the temperature record of the last ice age, obtained from analysis of Greenland ice cores such as GRIP2 ; and b, the pollen record from Lake Kopais, Greece13. A selection of sediment logs from key sites plotted in an N–S profile from the Pechora Sea to the southern Pechora Lowland. and Byzovaya and the bone layers at the Kolva river terraces. Many animal bones and several stone artefacts were uncovered from the basal layers of a 12 - 13 metre high river bluff which is cut into the terrace along a bend in the river. The finds, which were scattered throughout the excavated area (48 m2) without any clear concentrations, were incorporated in cross-bedded gravel and sand that accumulated on the floor of an old river channel. Many of the bones uncovered were encapsulated in silt and we also noticed frequent mud clasts (Clasts are defined as broken pieces of older weathered and eroded rocks within another rock more recently formed. Here it means a lump of mud found within a different deposit such as sand or gravel - Don) within the basal part of the find-bearing channel deposit, which probably reflects slumping from an ancient river terrace covered by over-bank mud. In all, 123 mammalian bones, primarily mammoth (114), but also horse (2), reindeer (5) and wolf (2), were collected. See the table below. (woolly mammoth) Rangifer tarandus L.
The most important find was a 1.3 metre long tusk from a young, 6 to 8 year old female mammoth which exhibits a series of distinct grooves (Figs 3 and 4). The marks are 1-2 mm deep, 0.5-1 cm long and appear as densely spaced rows of lines lying crosswise along the tusk. Microscopic analysis reveals that the grooves were made by chopping with a sharp stone edge, unequivocally the work of humans. It is uncertain whether the marks were formed during processing while using the tusk as an anvil, or if they reflect intentional marks with artistic or symbolic meaning. The mammoth tusk with incision marks is of special importance. Preliminary microscope analysis suggests that the marks were inflicted when the ivory was still fresh and that they were most likely made shortly after the mammoth died. 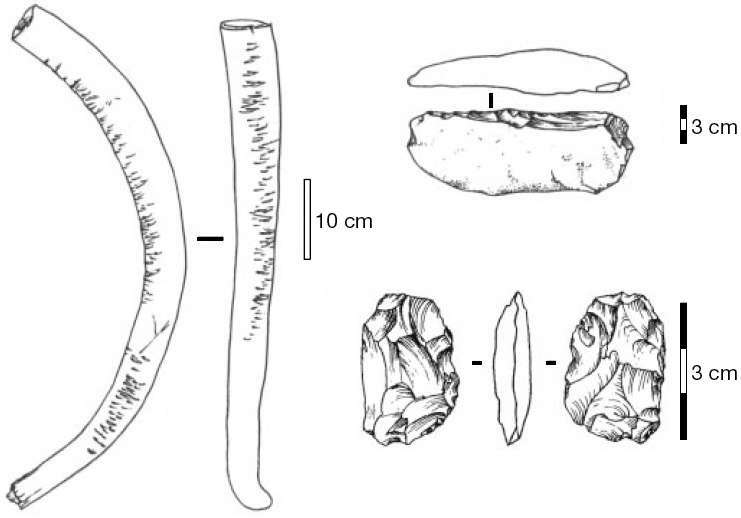 The stone artefacts that were excavated from the same strata comprise five unmodified stone flakes, a straight side-scraper on a massive cortical blade and a bifacial tool. The edges of the stone artefacts are sharp and the tusks and bones show minimal signs of wear, indicating a very short transportation and that the materials were swiftly buried by alluvial deposits. The few artefacts are not diagnostic and resemble Middle Palaeolithic Mousterian as well as the earliest Upper Palaeolithic assemblages in eastern Europe, a time interval which is also in accordance with the radiocarbon dates discussed below. Similar bifaces are reported for Late Mousterian sites on Crimea, for instance Zaskalnaya V, but they are also known from early Upper Palaeolithic complexes in Eastern Europe, among them Kostenki XII at the Don river. However, we are not able to determine the cultural affiliation on the basis of the sparse material found. 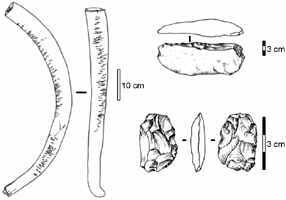 Caption: Drawings of the mammoth tusk with human-made marks, a side-scraper and a bifacial stone tool (knife?) 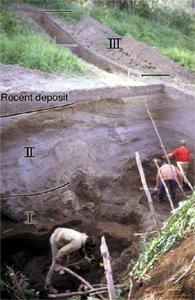 that were uncovered from the excavated river channel deposits at the Mamontovaya Kurya section. The OSL dates (calendar years), measured on quartz grains in the sand grain fraction, were produced at the Nordic Laboratory for Luminescence Dating, Risù National Laboratory, Denmark. The radiocarbon dates (14Cyr BP) were carried out at various laboratories. Beta, Beta analytic; ETH, the Swiss Federal Institute of Technology AMS Facility; T, Trondheim Radiocarbon Laboratory; TUa, prepared at the Trondheim and measured at the accelerator at the Svedberg Laboratory, Uppsala; LU, St Petersburg University The bones and tusks were in good condition, well suited for radiocarbon dating. The tusk with incision marks was radiocarbon dated to 36 660 14C years before present (yr BP) and three other bones from the same unit yielded similar ages in the range of 34 400 to 37 400 yr BP. This time interval is close to the maximum limit for obtaining accurate radiocarbon dates. Pollen analysis of the alluvial silt clasts that were found in association with the bones reflects a treeless steppe environment dominated by herbs and grasses, presumably with local stands of willow scrubs (Salix spp) along the river banks. Human occupation probably occurred during a relatively mild interlude of the last Ice Age, although the climate at this time was probably considerably colder and more continental than today. This mild interlude may correspond with the Hengelo interstadial (39 000 to 36 000 yr BP) in western Europe. A palaeo-environmental reconstruction suggests that the landscapes in The Netherlands and northern Germany and eastwards were then covered by a shrub tundra. 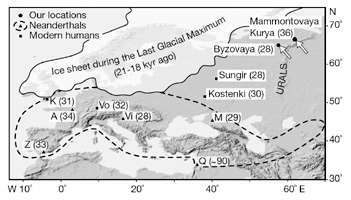 The northern rim of the Eurasian continent was evidently not glaciated and probably only small mountain glaciers existed in the Ural Mountains. 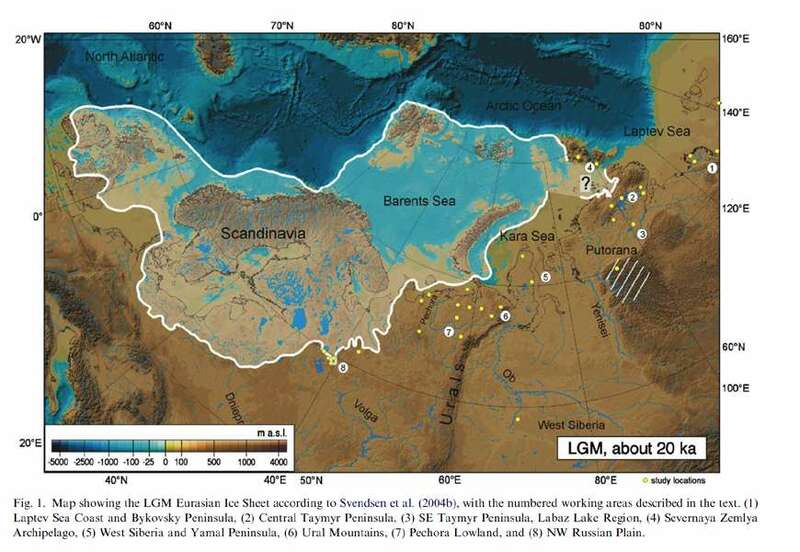 The Scandinavian ice sheet was probably much smaller than during the Last Glacial Maximum some 20 000 yr BP. Reconstructed geological history at Mamontovaya Kurya. 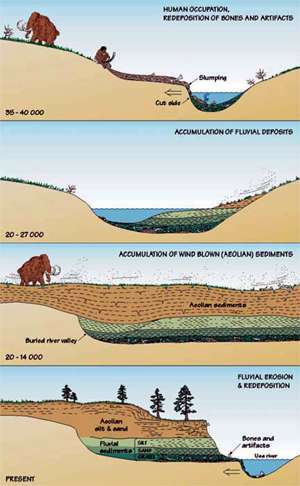 According to this interpretation the bones and artefacts slumped into the former Usa river soon after they were left on the riverbank 35-40 000 years ago. 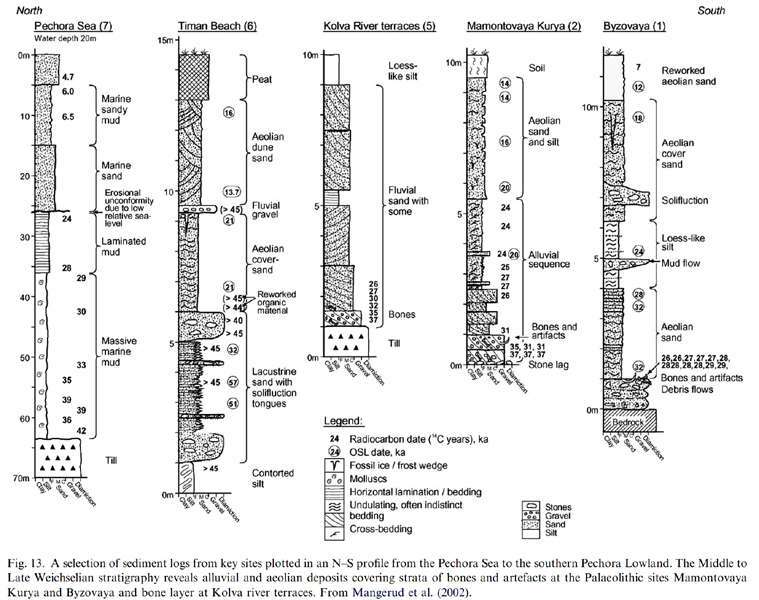 The findbearing strata were subsequently covered by younger alluvial and aeolian sediments. 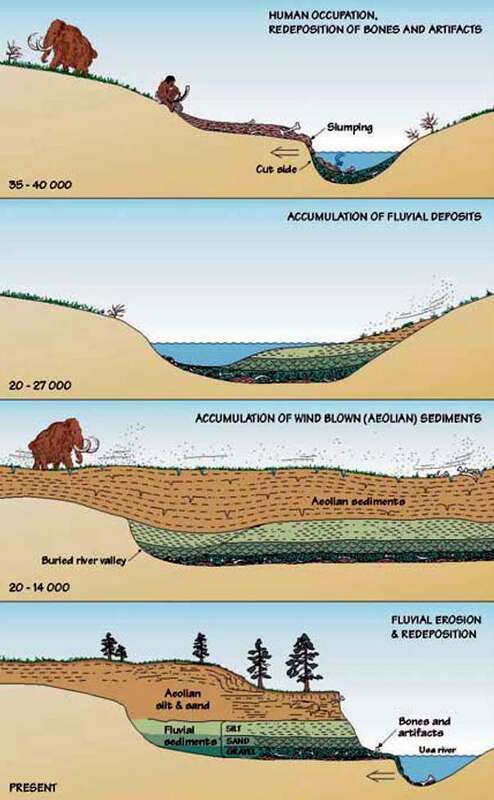 The present river started to incise into the sediment sequence around 14 000 years ago and exposed the layers with bones and artifacts along the present river bank. 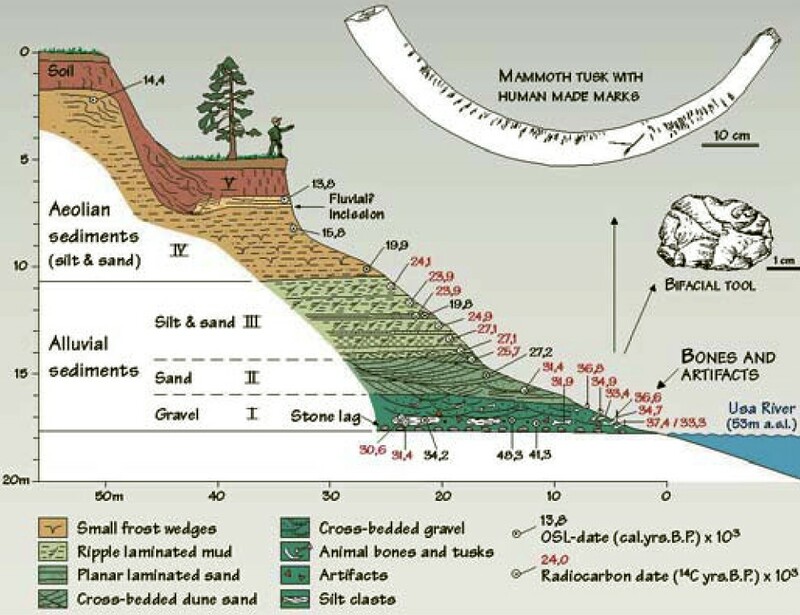 The fact that humans were present in this area as early as around 36 000 yr BP leads us to reassess the history of the earliest human occupation in the Arctic. Until now, the oldest known Palaeolithic sites in the Eurasian Arctic are dated to 13 000 to 14 000 yr BP. However, there is an early Upper Palaeolithic site close to the Byzovaya village along the Pechora river, approximately 300 km to the southwest of Mamontovaya Kurya. At this site nearly 300 artefacts and more than 4 000 animal bones (mainly of mammoth) have been unearthed during several excavations. An early Upper Palaeolithic age has recently been supported by 13 radiocarbon dates on bones from the find-bearing layer which have yielded ages in the range of 26 000 to 29 000 yr BP with a mean of about 28 000 yr BP. Следы человеческого присутствия почти 40 000 летней давности были обнаружены в Мамонтовой Курьи, на палеолитическом участке, расположенном в европейской части российской Арктики. Ранее полагалось, что эта обширная область не была колонизирована людьми до заключительной стадии последнего Ледникового периода приблизительно 13 000 - 14 000 лет назад. Среди найденных экспонатов стоянки , кости животных и бивень мамонта с метками сделанными человеком были обнаружены в слое, покрытых толстыми четвертичными отложениями. Это - самое старое зарегистрированное свидетельство для человеческого присутствия в этой высокой широте. Это подразумевает, что или Неандертальцы распространялись на много дальшена север, чем предварительно мыслилось или что современные люди присутствовали в Арктике уже спустя несколько тысяч лет после их первого появления в Европе. Заголовок: Фотография показывая несущие слои (I) вблизи основы выставленных отложений в Mamontovaya Kurya. Коричневатые слои с костями и экспонатами покрыты младшим аллювиальный (II и III) и эолийские депозиты (IV и V). Карта показывает местоположение Палеолитических стоянок Mamontovaya Kurya и Бизовая, обсуждаемого в тексте и максимальной степени евразийских ледяных покрытий в течение Последнего Ледникового Максимума (21 000±18 000 до нашего времени). Область, в пределах которой предполагается распространение Неандерталецев, обозначена пунктиром. Местоположение радиоуглеродных европейских участков со скелетными остатками покойных Неандертальцев и ранние современные люди также показывают: A, Arcy-sur-Cure; K, Пещера Кента; М., Mazmaiskaya; Vi, Vindija; Vo, Vogelherd; Z, Zafarraya; и Q, Qufzeh. Числа в круглых скобках указывают возрасты ( x 10³ лет до нашего времени). Мамонтовой Курьи стоянка расположена на южном берегу реки Usa, на высоте 53 метра выше морского уровня, на Северном Полярном Круге в 66° 34' N; 62° 25' E, близко к полярному Уралу. Русло реки на этом участке было известно как место, где были найдены гигантские бивни и кости в конце 18-ого столетия, но о находках ранее не сообщалось. Чтобы разъяснять стратиграфический контекст этих костей и узнавать, могли ли они быть связаны с ранней человеческой деятельностью, археологические и геологические полевые исследования были выполнены в течение летних сезонов 1992, 1994, 1996 и 1997. Много костей животных и несколько окаменелых экспонатов были раскрыты в 12 -13 метрах ниже от основных верхних слоев речного обрыва , который врезался в террасу по изгибу реки. Находки, которые были рассеяны всюду по выкопанной области (48 m²) без любых ясных концентраций, были включены в поперечно уложенный донный гравий и песок, который накопился в основании старого речного канала. Многие из обнаруженных костей были заключены в капсулу в иле, и мы также заметили частые обломки породы грязи (Обломки породы определены как лом старших выдержанных и разрушенных скал в пределах другой скалы, позже сформированной. Здесь это означает глыбу грязи, найденной в пределах различного депозита, типа песка или гравия - Дон) подобные основной части имеющейся прослойки канала, которые, вероятно, отражает отделение от древней речной террасы, берега покрытого грязью. В целом, 123 относящихся к млекопитающим кости, прежде всего мамонт (114), но также и лошадь (2), северный олень (5) и волк (2), были забраны. См. стол ниже. (шерстистый мамонт) Rangifer tarandus L.
(северный олень) Canis lupus L.
Самая важная находка, был клык 1.3 метра длиной от молодого, 6-8летнего женского мамонта, который показывает ряд отличных углублений (Figs 3 и 4). Метки 1-2 мм глубиной, 0.5-1 см длиной и появляются как плотно раздельные ряды линий, лежащих крестообразно по клыку. Микроскопический анализ показывает, что углубления были сделаны, раскалывая острым каменным краем, определенно работой людей. Неуверено, были ли метки сформированы в течение обработки, используя клык как наковальня, или если они отражают намеренные метки с артистическим или символическим значением. -Гигантский бивень с метками разреза имеет специальное значение. Предварительный анализ микроскопа предлагает, что метки были нанесены, когда слоновая кость была еще свежей и что они были наиболее вероятно сделаны вскоре после того, как мамонт умер. Каменные экспонаты, которые были выкопаны в тех же самых слоях, включают пять неизмененных каменных пластов, прямой скребок стороны на массивном корковом лезвии и двустороннем инструменте. Края каменных поделок остры, а бивни и кости показывают минимальные признаки изнашивания, указывая очень короткое использование и что материалы были стремительно похоронены аллювиальными депозитами. Немного поделок не являются диагностическими и напоминают Средний Палеолитический Mousterian так же как самый ранний Верхний Палеолитический сбор в Восточной Европе, временный интервал, которого является также в соответствии с датами радиоуглерода, обсужденными ниже. О подобных bifaces сообщают из Последних участков Mousterian в Крыму, например Заскальная V, но они также известны от ранних Верхних Палеолитических комплексов в Восточной Европе, среди них Костенки XII в реке Дона. Однако, мы не в состоянии определить культурное присоединение на основе редкого найденного материала. Фотография: Природа Vol 413, 6 сентября 2001 Заголовок: Рисунки гигантского бивня с человеческими метками, скребком стороны и bifacial каменным инструментом (нож? ), которые были раскрыты от выкопанных речных отложениях канала в Mamontovaya Kurya. Костяи и бивни были в хорошем состоянии и хорошо подходили для датировки радиоуглеродным методом. Бивень с насечками был датирован радиоуглеродом 36660 14C годом до нашего времени, а три других кости из той же самой группы датированы тем же возрастом в диапазоне 34 400 - 37 400 годами до нашего времени. Этот временной интервал - близок к максимальному пределу точного определения по радиоуглеродному методу. Анализ пыльцы аллювиальных обломков породы ила, которые были найдены в сообществе с костями, отражает безлесную окружающую среду степи во власти растений и трав, по-видимому с чередованием кустов ивы (Salix spp) по речным берегам. Человеческое расселение, вероятно, произошло в течение относительно умеренного перерыва последнего Ледникового периода, хотя климат в это время был вероятно значительно более холоденый и более континентален чем сегодня. Этот умеренный перерыв может соответствовать Хенгело interstadial (от 39 000 до 36000 лет до Нашего времени) в Западной Европе. Палео-экологическая реконструкция предлагает, что пейзажи в Нидерландах, в северной Германии и в восточном направлении были тогда покрыты кустовой тундрой. Северный край евразийского континента не был очевидно заморожена, и вероятно только маленькие горные ледники существовали в Уральских горах. Скандинавский ледяной лист был вероятно намного меньше чем в течение Последнего Ледникового Максимума приблизительно 20 000 лет до нашего времени. Восстановленная геологическая история в Mamontovaya Kurya. Согласно этой интерпретации кости и поделки споолзли в тогдашнюю реку Usa вскоре после того, как их оставили на берегу реки 35 - 40 000 лет назад. Принесенные слои были впоследствии покрыты младшими аллювиальными и эолийскими отложениями. Существующая река начала вырезать в последствии осадочная породу приблизительно 14 000 лет назад и выставила слои с костями и экспонатами по существующему речному берегу. Факт, что люди присутствовали в этой области уже приблизительно 36 000 лет до нашего времени, вынуждает нас переоценивать историю самого раннего человеческого появления в Арктике. До сих пор, самые старые известные Палеолитические участки в евразийской Арктике датированы к 13 000 - 14 000 лет До Н.В. Однако, есть ранний Верхний Палеолитический участок близко к деревне Byzovaya по Печорской реке, приблизительно 300 км к юго-западу Mamontovaya Kurya. На этом участке почти 300 поделок и больше чем 4 000 костей животных (главным образом мамонта) были раскопаны в течение нескольких раскопок. Ранний Верхний Палеолит был недавно поддержан 13 датировками радиоуглерода на костях от найденного-несущего слоя, которые привели к возрастам в диапазоне 26 000 - 29 000 лет до Н.В. со средней приблизительно в 28 000 лет до Н.В. 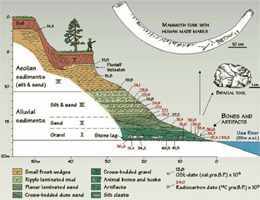 Mangerud, J., Astakhov, V., Svendsen, J.I., 2002, The extent of the Barents–Kara ice sheet during the Last Glacial Maximum. 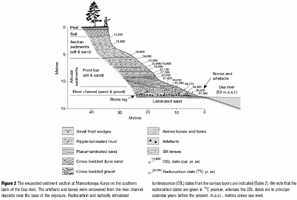 Quaternary Science Reviews 21, 111–119.